Unit Weight - 1600 lbs. 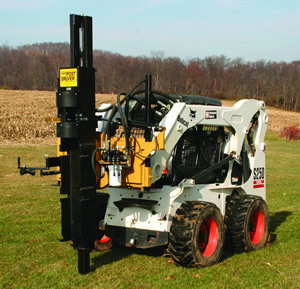 The Kiwi Skid Steer post driver allows for greater utilization of one of the most versatile pieces of equipment a fence builder can use. The mount has a unique sideways pivot that adapts to the quick attach plate of that particular model, which permits a 50 degree tilt.